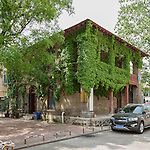 While Weihsien (now Weifang) was never a Treaty Port, it was the site of a Japanese Internment Camp from late 1942 until 1945, in which Allied nationals were incarcerated. These nationals were residents of several Treaty Ports in Northern China including Tientsin, Tsingtao and Chefoo. Perhaps the most famous of the Camp's inmates was Eric Liddell, of the London Missionary Society, a gold medal winner in the 1924 Olympics in Paris. 'Uncle Eric', as he was known, died in the Camp from a brain tumour on 21 February 1945. Two of my relatives, William and Lionel Howell, together with their wives were also interned at Weihsien. William Howell died in the Camp on Christmas Day 1944. The former camp today consists of a large memorial area, with the names of all inmates listed in both Chinese and English, the restored Shadyside Hospital building, which includes an impressive exhibition, Blocks 50, 58, 59 and 60 used by inmates and one of the residential blocks for Japanese guards. 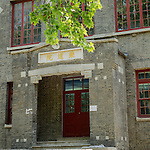 Of these surviving buildings, the old hospital has been restored to a high quality. Two other buildings survive - another guards' residential block and the Camp's general store - but these are located in an educational campus for which prior notice is required in order to access. The camp itself had originally been a large Presbyterian mission compound known by the Chinese name of "Courtyard of the Happy Way" and, fortunately, already included a well-established hospital, the "Shadyside Hospital", although much of its equipment had been removed by the Japanese before the internees arrived. Two internees, Laurence Tipton and Arthur Hummel, managed to escape on 10 June 1944 and joined a Chinese guerrilla group. Among other things they arranged for medical supplies to be smuggled into the Camp. The Camp was relieved on 17 August 1945. One Side Of The Liberation Memorial. Main Entrance To The Shadyside Hospital Building. Main Entrance To Shadyside Hospital. Rear Of The Shadyside Hospital Building. A Side Door To The Shadyside Hospital Building. Panorama Of The Camp Model Exhibit. A Room Dedicated To Eric Liddell. Moongate Into Blocks 58,59 & 60 On "Wall Street". Blocks 59 & 60 (near) On "Wall Street". Block 58 On "Wall Street". Blocks 58 (left) & 60 (right) On "Wall Street". Blocks 58 (left) & 59 (right) On "Wall Street". Block 50 At The Weihsien Internment Camp. Detail On The Japanese Quarters. A Bell, But Not The One Used For Roll Call.